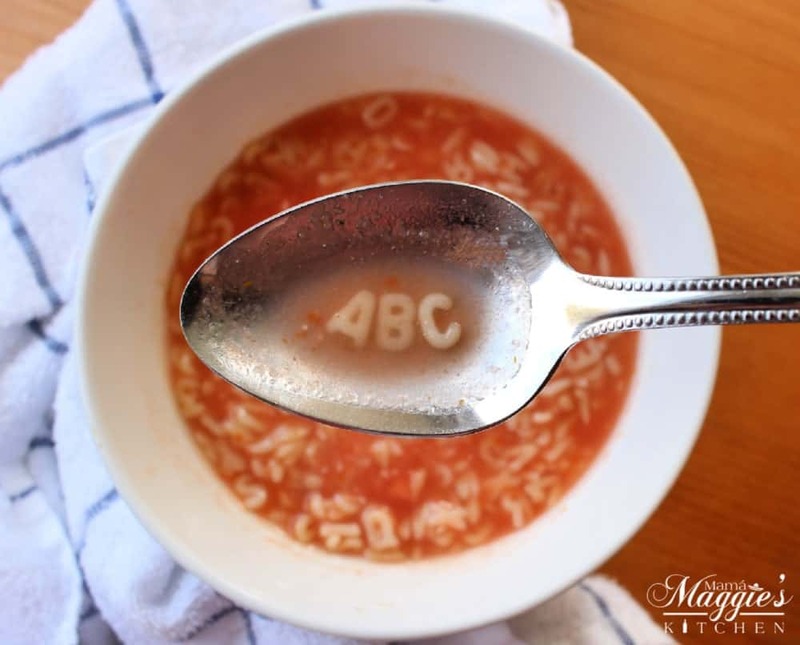 Sopa de Letras, or Mexican Alphabet Soup, is a childhood favorite. This Mexican food classic is comforting, delicious, and educational. Watch the VIDEO or follow the step-by-step photos below to recreate this dish. When I was kid, my brother and I would get home from school, throw our backpacks down, and eat a big bowl of Sopa de Letras. We would spell our names. It’s how all Mexican kids learned the alphabet. lol. You will need alphabet pasta from the pasta aisle at the grocery store. Sometimes, it’s little hard to find. They come in tiny packages. You can usually get three for $1. If you can’t find it, look for it in the Hispanic aisle next to the fideo and the conchas. 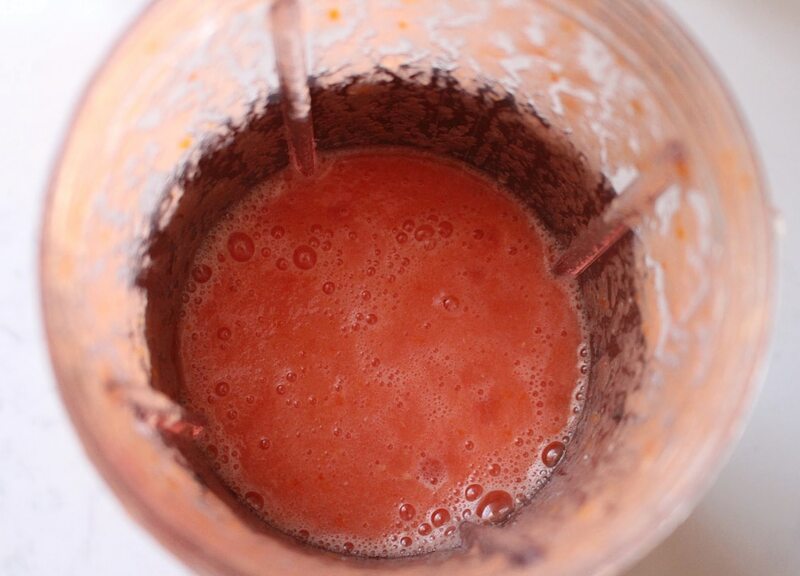 Blend tomatoes, onion, garlic, and water in the blender until smooth. No chunkiness allowed. Stay smooth, my friends. Then set the tomato sauce aside until ready to use. You can also use a can of tomato sauce and skip this step, but I wanted to give the “from scratch” recipe. See how vibrant red it is? That’s because the tomatoes have not yet been cooked. I love this color! It reminds me of bullfights I never saw. 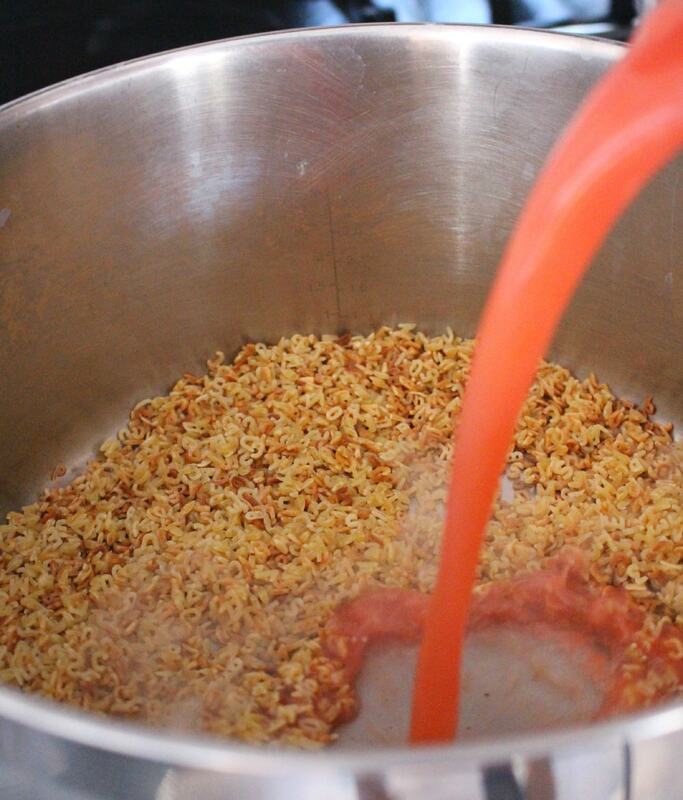 Add oil in a large stock pot. You will need a pot big enough to handle the Sopa de Letras. Time for the pasta. Don’t go far away, or they will burn. 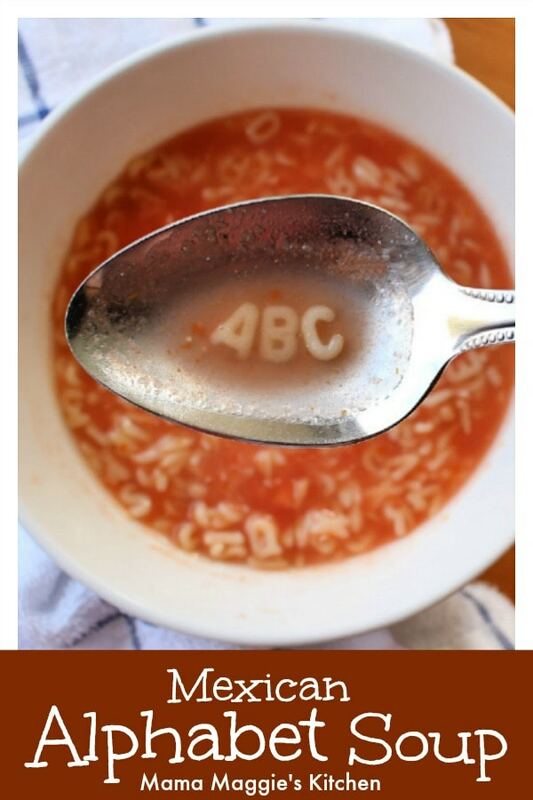 Toast the alphabet pasta well. It will only take few minutes. Toasty is tasty. If the pasta burns, you need to throw away the pasta. Wash the pot and start all over again. I repeat: Don’t go far from the pot when toasting the pasta! Now add the tomato mixture to the pot with the toasted pasta. Stand back! This will splatter, and no one likes to get burned. The letters may look small, but the letters expand with the liquid… and so will your smarts. Water goes in next. I don’t add a lot of water because the letters are easier to find. Fishing has never been my sport. 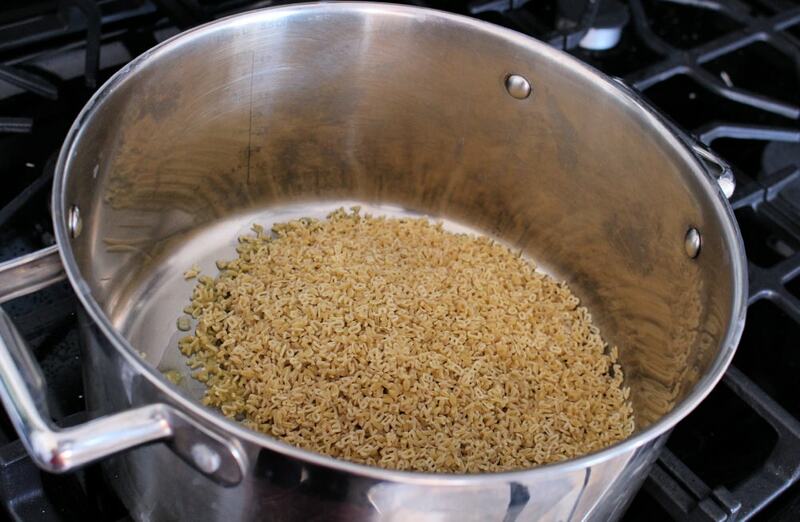 If you want a thinner soup with more broth, add more water. Chicken bouillon gives the soup a lot of flavor. It also salts the liquid. 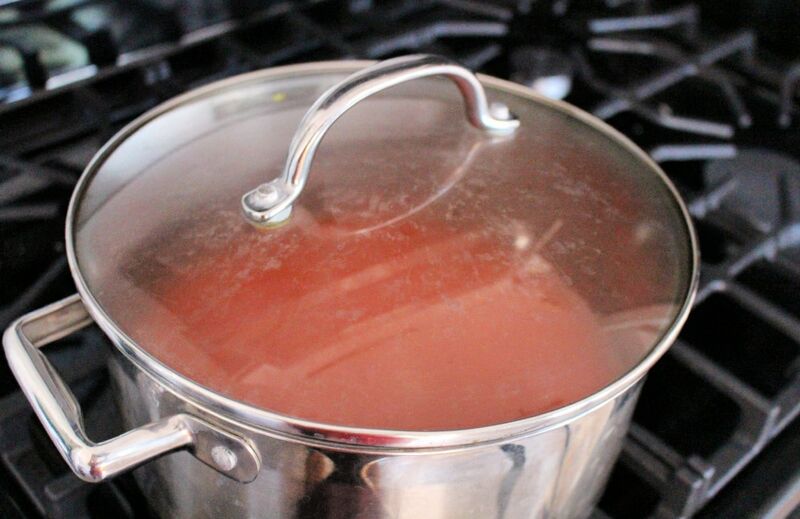 If you are not interested in using chicken bouillon, you can use chicken broth instead and omit the water. For my vegetarian readers, you can use vegetable broth. Give everything a good stir. Cover with a lid. Let this cook for 20 minutes, or until the pasta is tender. It renders some deliciousness. 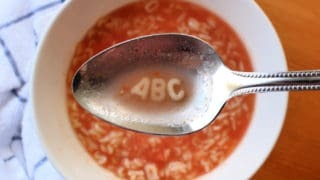 Sopa de Letras brings back some great childhood memories. Some of which I remember. 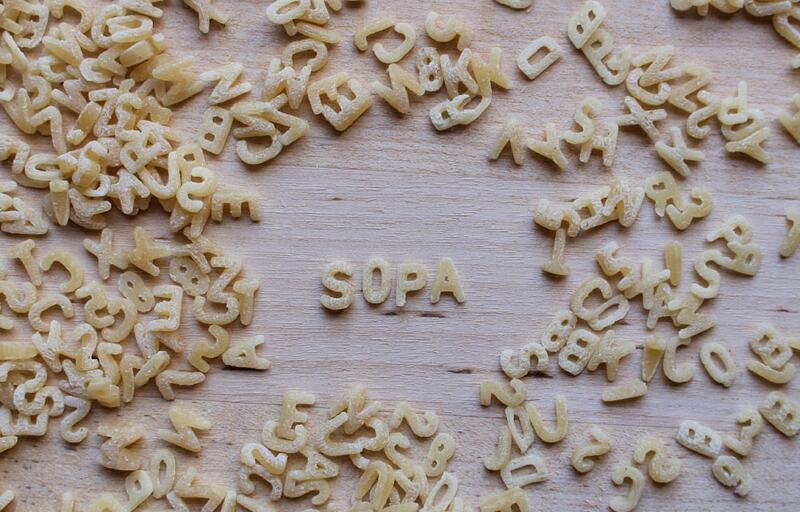 Sopa de Letras, or Mexican Alphabet Soup, is a Meal of Fortune. Can I buy a vowel? haha! After a long day of hanging out with the nuns at our little Catholic school, one of my favorite things to do was to get come to a bowl of this soup. Hope you enjoy this Mexican childhood favorite. 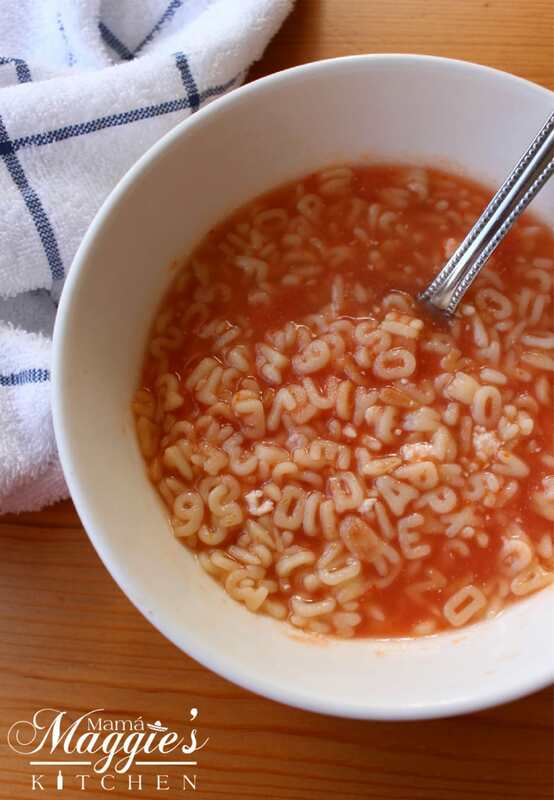 Sopa de Letras, or Mexican Alphabet Soup, is ready in minutes and perfect for picky eaters. 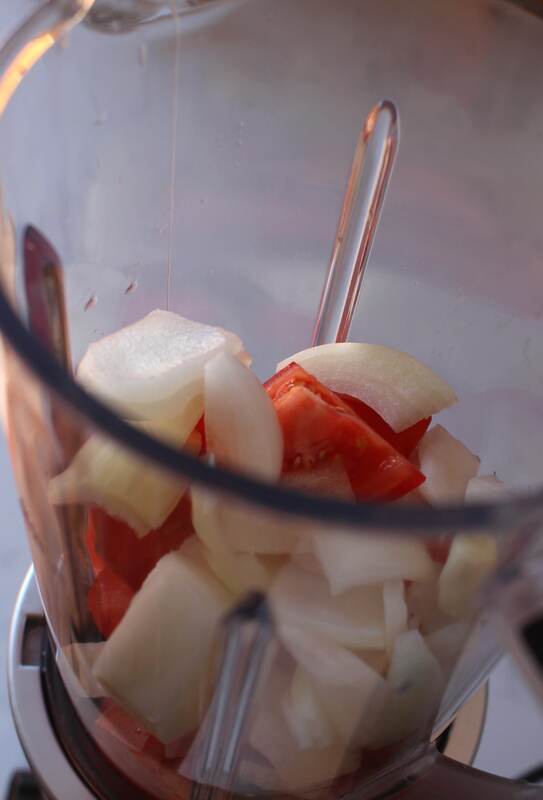 To a blender, add tomatoes, onion, garlic clove and 1 cup of water. 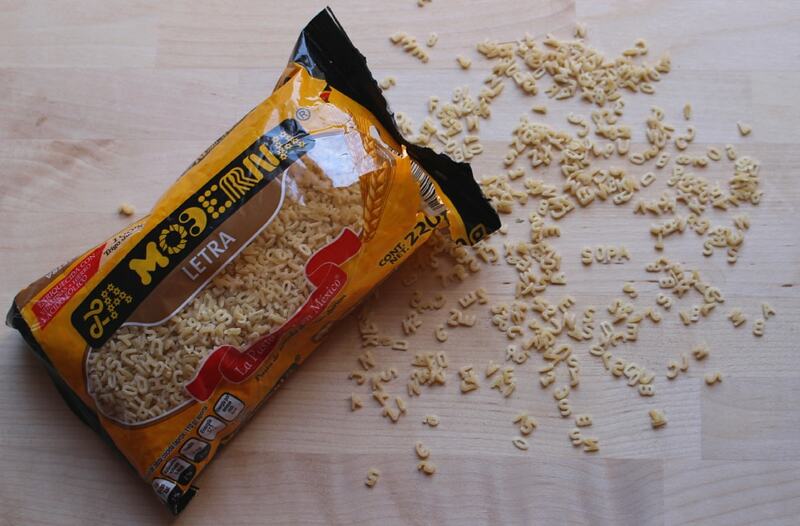 Add package of alphabet pasta. Stir frequently until golden brown. Do not let this burn, or you will have to start all over again. 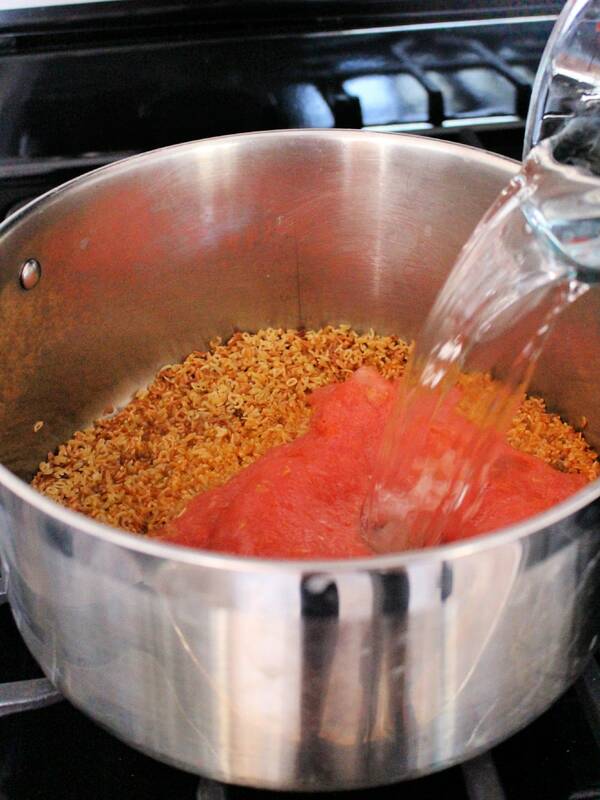 Add 4 cups of water, tomato mixture, and chicken bouillon. 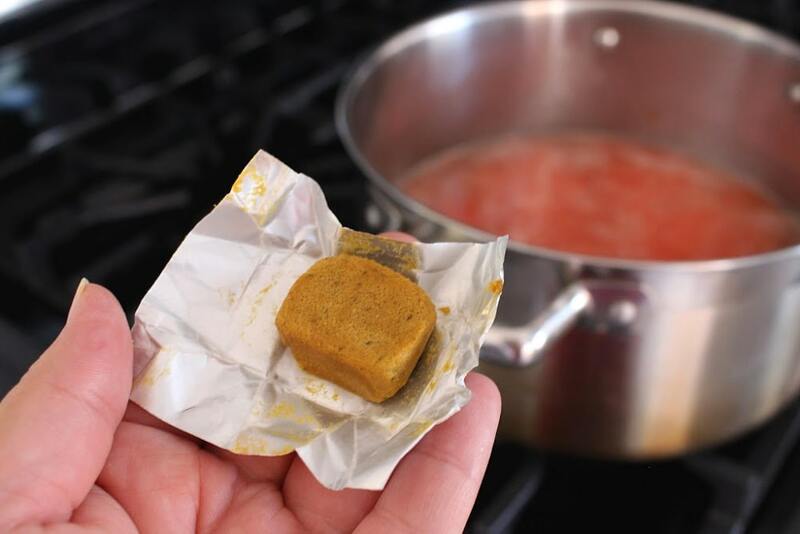 Cover and bring to a low simmer. Cook for 20 minutes, or until pasta is soft and the conchas have puffed up. Don't like chicken bouillon? Omit water and chicken bouillon, and use chicken broth or vegetarian broth instead.